Memory specialist semiconductor firm Micron has published an interesting blog wrapping up what it saw in 2017, and offering a hint of things to come for 2018. 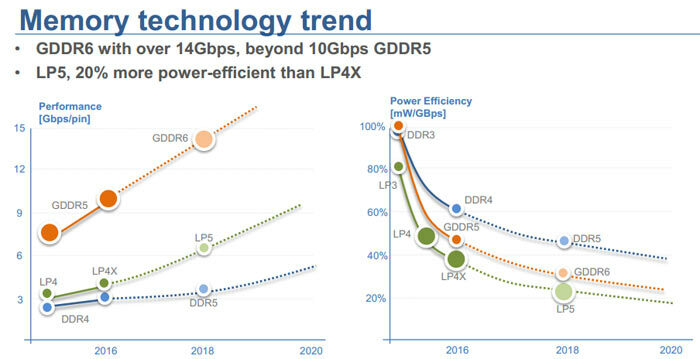 Director of Micron’s global Graphics Memory Business, Kris Kido, penned the blog which provides insight into the progress of GDDR6 development and some tech deep dives on designing GDDR6 at 16Gb/s. GPU demand was set alight by gaming, virtual reality, crypto mining, and artificial intelligence in 2017, notes Micron. In gaming higher resolutions displays such as UHD 4K monitors, and multi-monitor setups, including VR headsets pushed up demand for faster GPUs featuring Micron’s GDDR5 and GDDR5X memory. All in all it was a record year for GDDR5 shipmets for Micron and it provided a performance boost to graphics card designers with the launch of 12Gb/s G5X “the highest-performance mass production GDDR memory”. In 2018 Micron sees the thirst for faster graphics and memory to continue to be unquenchable. With its GDDR6 program was on track and with design and device qualification are complete Micron looks forward to offering the new graphics memory to customers. It adds that GDDR6 is closely related to GDDR5X in some ways which will make it particularly easy for Micron and its partners to move forward. Micron sees a path for GDDR6 to offer a 16Gb/s bin over time. However, initially it will roll out on a par and lightly above top GDDR5X speeds at mass production bins of 12 and 14Gb/s. Micron signs off by teasing that “2018 is going to be another big year for anyone who loves graphics tech”. Remember, there are signs that graphics cards packing GDDR6 won’t be confined to offerings from the green team. A recent slip up by a principal member of AMD's technical staff on his LinkedIn profile indicated that a GDDR6 memory controller was in the works at AMD. Is it a big year since it is overpriced which means moar money for them since AMD and Nvidia won't have a choice,or a big year since it will be more cost effective than HBM2 and GDDR5X meaning midrange and lower end cards can finally not be so held back by memory bandwidth,ie,they can pack more shaders into them and can still use a narrow bus to make the card cheaper?? We are moving on, to GDDR6 because HBM2 is too expensive and can't be produced easily: see last two gens of AMD cards ruined by choosing this instead of easy to use and make GDDR5x. It's sad AMD keeps going down a road that is a buzzword instead of useful today. If you don't need the bandwidth quit killing your margins/profit by using a memory that holds up production (for year this time) and keeps cards from selling (you can't sell what you can't make). This is why NV is setting records (choose easily produced stuff unless the alternative WINS), while going the easy route and stocking shelves with stuff we can actually buy. Not sure why you're so interested in using a memory that causes price hikes due to production issues. If you like cheaper prices, you should be hoping everyone goes for GDDR6 over HBM crap that may be useful one day for gamers if it ever gets price competitive. If AMD had not been slowed down so much by issues with HBM they might have been able to release cards earlier and actually produce some competition with Nvidia. I think AMD know they need to do something different to stand out but at the end of the day what matters most for their customer base is what FPS they can provide at what price point compared to the competition. If they're implementing tech that slows down release dates then they might as well just make slower cards. The effect is the same.